The theme of today’s post is being in a rush. That frantic action-stations kind of rush where you either slip into complete zen mode and float through the situation to your destination/goal, or where you run around like a headless chook/fall over your own feet/sit on the floor paralysed by how you’re not going to make it. There’s also that rather unique kind, one that results in you taking rather shoddy photographs (see exhibits a, b, c and d on this post) because you’re far too eager to consume the food being photographed. Which is ironic really, as it means the photos do very little justice to the specimen that is in fact knee-tremblingly tasty. 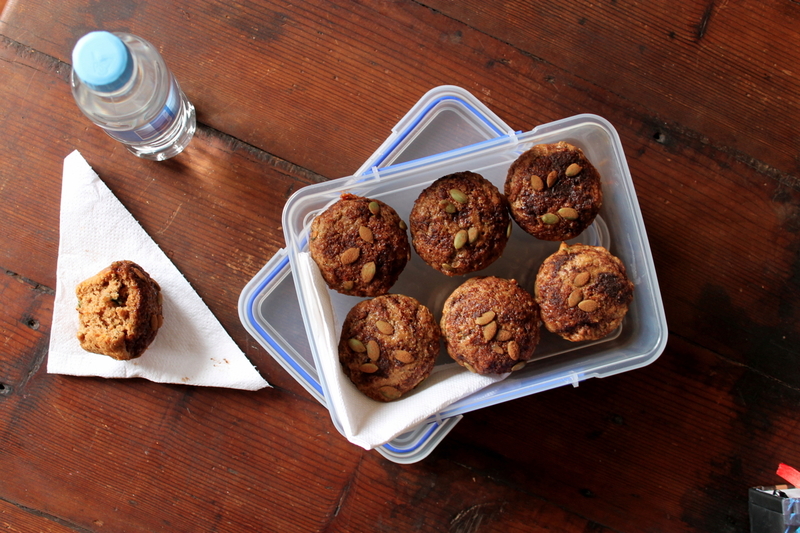 You’ll just have to take my word for it: these muffins are to.die.for. And you won’t even die from them – each muffin contains just ¼ tsp olive oil and ¼ tsp sugar! Most ideal for grabbing as you head out the door to rush to wherever it is you are rushing to (gee this post could easily become a drinking game…I didn’t suggest that…sssshhhh), these muffins contain many nutritious substances (yeah alright, they’re not superfoods but we need affordable ingredients, okay?) such as sweet potato, zucchini (you may or may not have guessed those from the recipe title), apple and pumpkin seeds. Plus the usual whole-wheat flour! All that nutrition. In a muffin. Wheeeee! 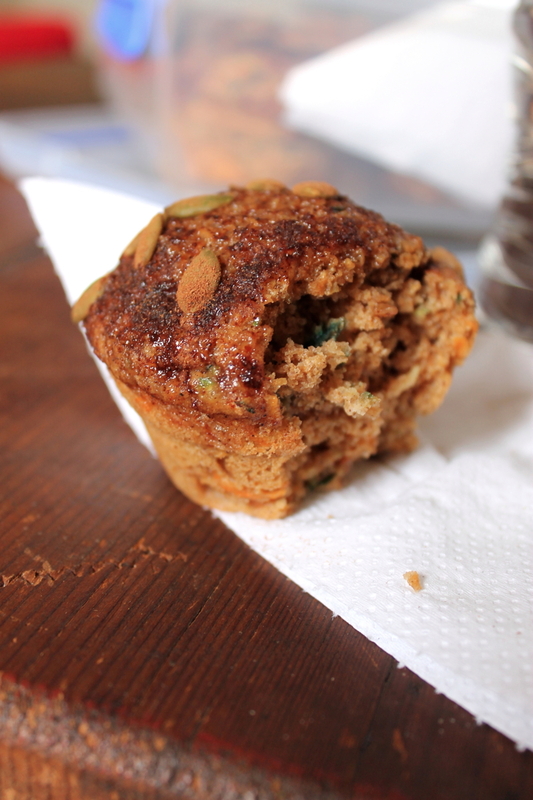 The grated vegetables and apple puree result in a sublimely moist muffin that is somehow dense yet also fluffy (go figure) due to the whole wheat flour and buttermilk. Cinnamon, nutmeg and cloves provide a pop of spice – a zing that is essential for those ‘mooooovvveeee I’m in a rush’ kind of moments. Early morning starts become far easier to cope with when you’ve got a delicious – and already prepared – breakfast lined up. Such as these muffins! Not the case in the snippet below, but they easily could have been the meal of choice. Yesterday we clambered from bed at what felt like the crack of dawn (it was 6.10am to be precise, which is later than I used to get up for cooking college, but hey I was younger and more sprightly then) so that I could hop on a plane back to Melbourne. We had the timing down pat with a bircher muesli made the evening before to eat in the car and a few minutes up our sleeves to pick a few big, fat, dark, juicy cherries off the tree. Because fresh cherries = life. But you know how they always say to leave a smidge of time spare for unexpected delays? Well it’s true. Because the horse could have executed its well practiced ninja escape from the paddock, and that big gum tree could have fallen slap bang over the driveway. Not to worry, it simply adds to a far more interesting morning! Involving chainsaws, and axes, and dragging big branches around like you’re a boss. You still manage to arrive at the airport with roughly fifteen minutes remaining prior to the gate opening, and it’s all hunky dory. The best kind of in-a-rush situation. I.e. 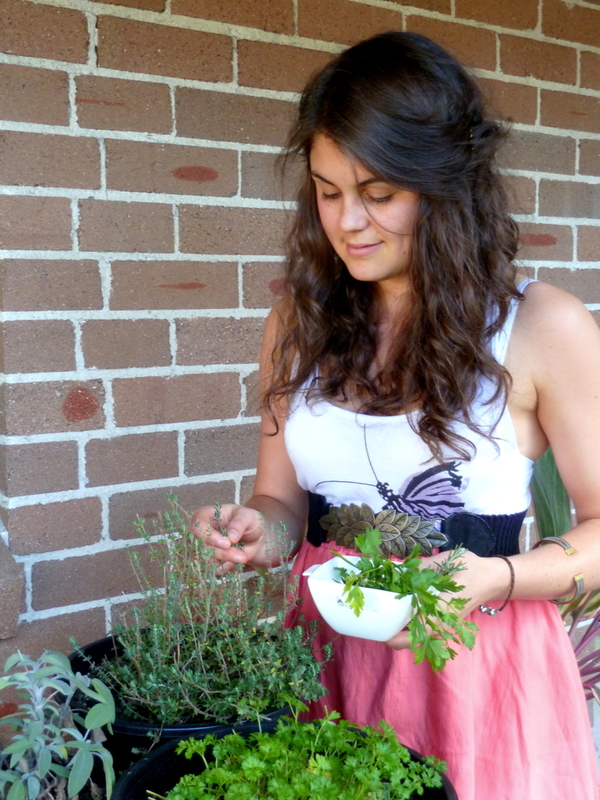 one that is executed well and involves minimal stress/scatter-brain syndrome. 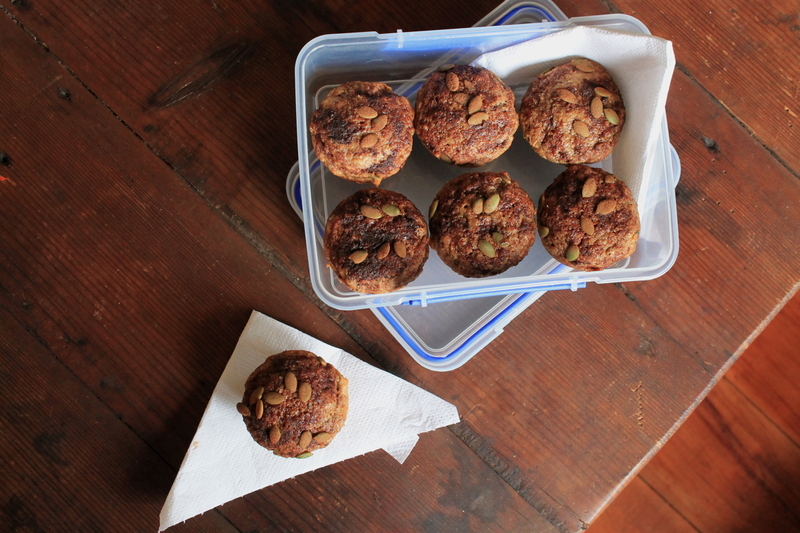 This scenario falls into the unplanned rush category but for its brothers and sisters that fall into that of the ‘expected rush’, make sure you’ve got a few of these Sweet Potato and Zucchini Muffins in the freezer, ready to be defrosted. Healthy and delicious sustenance never goes a miss in frantic situations! Preheat the oven to 175C and lightly grease 12 muffin holes. In a large bowl combine the flour, bran, bicarb soda, baking powder, salt, cinnamon, nutmeg and cloves. In a separate bowl whisk together the buttermilk, apple puree, olive oil, egg and vanilla. Fold the wet mixture through the dry until just combined, then stir through the grated zucchini, sweet potato and pumpkin seeds. Divide the mixture between the muffin holes. Sprinkle each with a little of the topping mixture. Bake for 23 minutes or until spring back when touched and a skewer comes out clean when inserted. Set the pan on a wire rack and leave to cool for 5 minutes before gently removing the muffins and leaving them to cool completely on the rack. Serve warm or at room temperature, either as is or with a smear of butter and/or honey. Will keep in an airtight container in the refrigerator for up to 5 days. Can also be frozen for up to 2 months.